Now you have a place to share your fanship. Or just express how much you like indian food. Whatever you think is relevant. Also, Umbagog’s anniversary is coming up! It coincides (roughly) with my birthday on November 6th. Which is nice. I get to have a birthday for myself AND my comic. S’all good, yeah? I’ll have to think of something special to celebrate that with. Besides the end of Chapter 2 and the release of Chapter 3, that is! Oopsie! turns out I uploaded this week’s comic a week early! Too eager to show off what I’ve got I guess :I . Hey folks! The Umbagog Patreon has been updated to included more rewards at both low and high level tiers. The $1 tier has been reinstated! If you just want to show support but can’t afford much more, the gesture is welcome. The $2 tier now includes private livestream access and thank you page recognition!! The $5 tier is unchanged, but at this tier you get to see pages two weeks earlier than free watchers. The $10 tier now includes behind the scenes access. 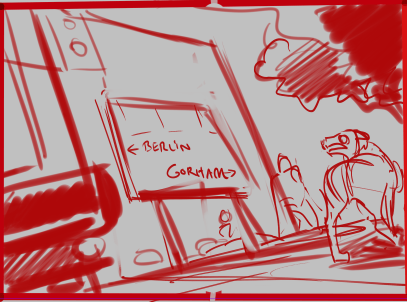 Chapter thumbs, rough pages, and in progress designs will be shared with you. The $40 tier includes not just a custom portrait of yourself as a zombie, but inclusion in a background crowd after 4 months or more of pledges. (robots and furries will become toys or book covers to not break in-universe aesthetic). I really hope these updated pledge levels will encourage folks to support me making this comic. It’s a labor of love, and any way you can show the love back is super duper appreciated. Every comment and view is treasured. Thanks for helping me along. It means a lot to know the story matters so much to people. Yep, freaked out dog! Now go read the latest page here. There’s been two new spreads uploaded to our front page since the last post. Go check those out for more news. And explosions. And giant ravens. Gotta love giant ravens!